The alarm clock going off, with birds singing and the sounds of the babbling brook near our house and the sun peeking out…. Oh wait That was the dream I was having…. It was more like the alarm BLARING, still dark out and everything totally frozen including the babbling brook. Hell it wasn’t even light out yet and the moon was still Bright n full. In any case when we get up to an alarm clock in my house it is almost always because we are doing something fun that day. Today was going to be no exception. I was in charge of the first group going to Tonga Ridge today. The goal was to make high point and get the Hangover trophy. Ron Mader showed up right on time and me and Casey got our last-minute things together. It was cold and it was freezing but the roads seemed to be pretty clear. We met up with John Vandergrift at the Chevron in Sultan by the roundabout, got fueled up, a few goodies to put under the hood for warm foods by Ron and we were off. We met up at the trestle about 7:50 ish a few minutes early, but others were there already prepping their vehicles, airing down, mud flaps, etc. Chris Mclean with Chris Dirkes and two others riding along with him, Jim Becker and his son. Others followed shortly there after, Rudi and Melissa, with Cassidy pulled in, and then Rick and Jennifer all the way from Oregon. Evan in his usual gleeful manner comes speeding into the area from the trail doing a spin out and getting into line. I told everyone they could leave at anytime and if they wanted to pair up do it now.. the race was for high point and I knew we wouldn’t get very spread out. We noticed a white four runner coming out of the trail and head out..hmmm that was weird this early? With that Rudi took off first. It was about 8:25 by now and I wanted to stick it out till at least 8:30 am in case any late arrivals showed. No one else showed so up the mountain we went. It was just John and me at the tail end. The snow was packed pretty good and everyone was doing very well by the time we got to the firepit or fire barrels, and everyone just continued on. We had caught up to Rick and Jennifer and we all stopped for a Kodak moment and the “Dead Mans Corner”. It was a gorgeous day with the Sun shining and not hardly any wind at all. It was a bit chilly but standing in the sun felt great. Chris had stopped to take in the view and set up his hammock to get some prime photo shots. I found out here that Chris did not have a radio. But his rig is well built so we decided to pass him as he broke down his hammock and prepared to bring up the rear. We had caught a few blips on the radio that Rudi and guys up ahead had come across a Buggy with some problems, but the guy assured Rudi he was ok.
We also caught a few blips on the radio that the second group being lead by Chris Brown was making their way up the mountain. As we motored on we came across the guy walking and I stopped to be sure the guy was alright. Actually Casey and I only saw him walking, so wanted to be sure he was ok. He assured us his buddy in the 4 runner had left to get more propane and was coming back to help. He was bundled up good and he told us he was fine and warm and they had been up there all night. So we continued on letting him know we would be sure he got off the mountain. Around the next bend we saw his buggy parked off the trail. I think Rudi was leading at this point or maybe Ron had gotten out front. But when they got to the turn off for the Quarry or Gravel pit or whatever you want to call it. Ron asked if we should follow the tracks to the quarry? 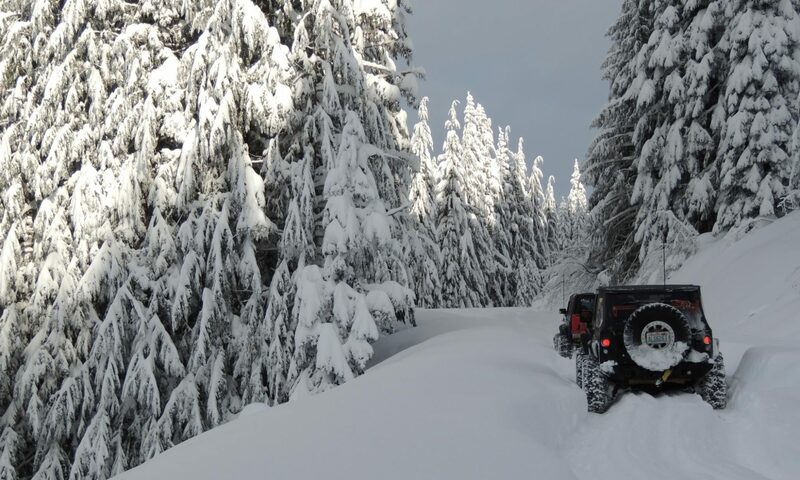 Or break trail in some fresh new deep snow. The decision was made to break new trail. This proved to be quite the effort. BY the time we caught up to them they hadn’t made it 1000 feet in the deep snow. Evans hood was up and he was having electrical problems. Rudy was all over that getting it diagnosed and fixed up quickly. Ron was having a tough time breaking trail with Donkey in LOW LOW gears chugging along. I decided I was going to give it a go and see how my now flat (1psi) Iroks could do? I got along side Ron and Donkey but wasn’t making any more progress than Ron was. So I backed out. Some of the others from the second group had caught up to us by now and next up was Josh Tourney. He tried and busted through my point, but was then bogged down and sunk in the snow. The snow was just not letting us float on top very long at all before we would sink. Rudi had to give it a try and he busted through where Josh had gotten to, getting around Ron and making it up a bit farther maybe 50 feet before he got stuck. I wasn’t sure what Ron was doing but I took the opportunity to go around him and make my way up to Rudi as Rudi was now shoveling snow from beneath his rig. Moose was now close enough to hear the radio chatter and reminded Rudi that we were a wheeling club, not a shoveling club. Well this prompted Casey to tease Rudi about it until he showed up at Casey’s window with a shovel full of snow.. I though for sure he was going to toss it in her lap.. But he only got some into her face and cooled her down for a minute or two..LOL. We got Rudi unstuck and backed up a bit and then he backed towards Casey in a teasing manner. With Casey holding the trophy and trying to get out of Rudi’s way she took a tumble into soft snow and was laughing and having a good time. Rudi helped her to her feet making sure she was alright. Next up here was Anthony Arreola in his buggy with Tiffany riding shotgun that had to have a go for the trophy. He made it up a ways farther then Rudi had gotten and it looked like maybe he was going to get the trophy. Casey was teasing everyone with the trophy and at this time she handed it over to Tiffany. But wait, her comes Ron again in Donkey and he chugged past Anthony by a few feet. So then Anthony had to power up and pass Ron. They did this a few times and then Anthony sunk deep in the snow getting pretty much turtled and out of the game. It only took Ron another shot at getting out front and he did it with style, powering up and speeding through his high point to go another 20 or 25 feet passed Anthony. As Ron Backed out Tiffany reached out to hand over the trophy to Ron. With High point made with witnesses we decided to turn around and head up into the quarry. The snow was sugary and soft and not packing very well and it seemed as long as everyone went slow we could get enough traction to get up to the quarry or bowl area. I think one person had a slight problem and needed a quick tug to make it up to the top. We got rigs lined up as best we could for some photo shoots and had our lunch break. The sun was out and shining down on us and everyone was doing well with no break downs It was a beautiful thing being up there. Evan played in his jeep trying to make a higher point. But he could just barely reach to top of some tracks that were made from a tracked vehicle. The radio began to crack and it was Chris leading the lower group. They had made it up to the buggy break down and apparently the white 4 runner was back and trying to get the buggy out by towing it. I don’t know the details but it sounded like everyone had to kind of get off to side of trail to let the buggy go by which really tore up the packed trail and cause a few slight problems. He was letting us know they were going to go ahead and turn around at this point and head back down. Sounded like a good plan. So we all packed back up and headed down behind them by maybe 20 minutes or so? Once we got to the spot where everyone had turned around the snow tracks were pretty much a mess and it was all soft. With Rudi behind me we got the strap loose and hooked up to him to tug me back..No go.. I wasn’t budging. By now, Ron had tugged Michael forward so he maneuver back around Michael to give me a tug with Donkey. One tug forward and I popped out. So Casey is telling me this is a double charge on a tow fee?? What???? Hee hee. With us all moving again we made ur way down past a group of about 4 rigs that had pulled off for the first group and was kind enough to let us go by. We made it back to the firepit area and Rudi decided to put some air in his tires as he had pretty low tire pressures from up top fighting for the trophy.. I think he said 2psi with no bead locks? Whoa that is low. As we kept our pace going it wasn’t long before Rudi was bringing up the rear and we all rolled into the parking area together. The first group still had some people there, but most had aired up and were gone. Everyone had a great time and it sounded like everyone was very good at wheeling and had tons of fun in the snow.. Not too many stucks, minimal break downs. And a trophy winner. It was a good day to be a Tamer on a Hangover Run. Thanks to all who helped out, and all who joined in and had fun.